Any person, regardless of age, gender, ethnicity, or nationality, who witnesses or has knowledge of police misconduct, may file a complaint. Misconduct may be defined as actions which are in violation of state or federal law, violations of departmental policies or procedures. Generally, complaints are filed through the supervisor of the involved employee, however you may also file a complaint through any supervisor, the department’s Duty Officer, the Internal Affairs Unit or by mail. Office hours - Monday thru Friday 8:00 A.M. to 5:00 P.M. Call 602-223-2000 and request to speak to a supervisor in the area of the incident. This service is also available 24 hours a day, year round. The department views all citizen complaints against its employees very seriously and actively pursues investigations into misconduct. For this reason, you must ensure your complaint is based on fact. False reporting in an attempt to unjustly subject a police employee to underserved discipline, slander, or place his/her employment in jeopardy can result in criminal charges and/or a civil suit by the involved employee. The Arizona Department of Public Safety is committed to ensuring that racially biased policing does not occur within our Agency. We have specific policies and procedures, coupled with on going training, to enforce this commitment. Additionally, we encourage the public and others that we come into contact with, to provide the Department with feedback, commendations or complaints, about the employee service that was encountered and received. The commendation/complaint form can be printed, completed and returned to the Department to assist us in knowing how you view our Agency and it's employees. 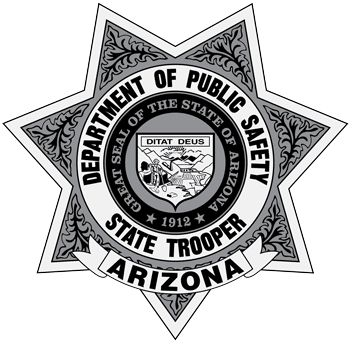 To learn about traffic stop data collected by DPS, click here.